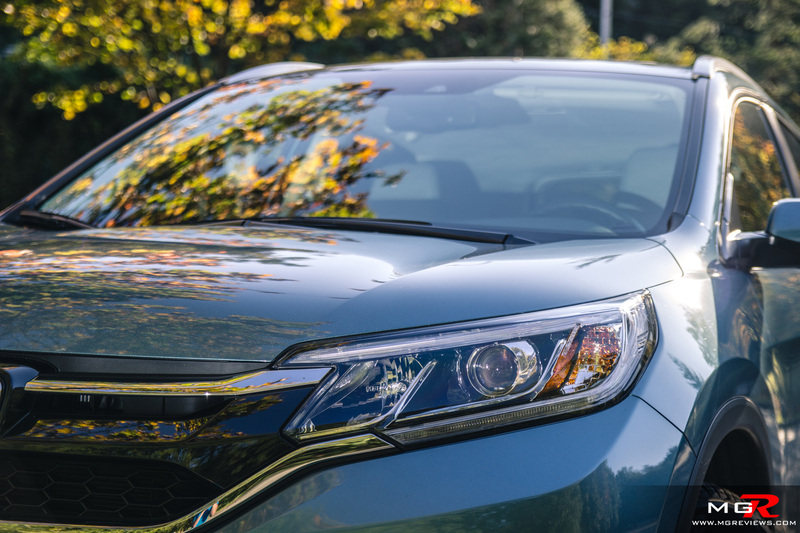 Crossover vehicles seem to offer just about everything the average consumer looks for in a daily commuter vehicle. It offers a high driving position, space for 5 occupants with room to spare for cargo, and an engine that delivers fuel efficiency figures that closely resemble what cars can achieve. 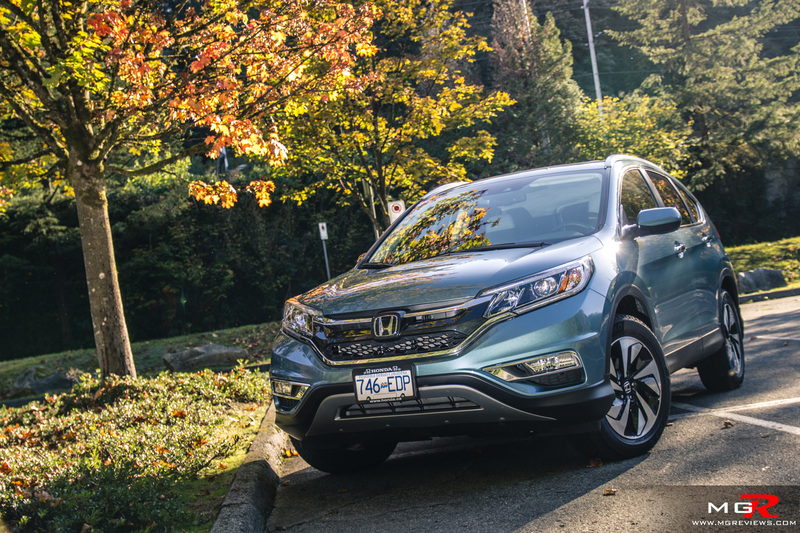 The Canadian made Honda CR-V ticks off all of those boxes and then some as one of the most popular crossovers in North America. Performance – 0-100km/h or cornering G’s are not what the Honda CR-V was designed for, not even close. So here’s the shortlist; 2.4L 4-cylinder engine, 185hp, 181 lb-ft of torque, 0-100km/h (with the all-wheel-drive system) in 8.8 seconds, fuel economy (all-wheel-drive) 9.5 L/100km in city & 7.5 L/100km on the highway. These figures are pretty much average when compared with other non-turbocharged 4-cylinder small SUVs but where the Honda shines is with it’s unbeatable fuel economy figures. The only other vehicle in this segment that comes close to matching the Honda’s fuel economy is the Toyota Rav4 but it’s still off by 1.1 L/100km in a city and 0.6 L/100km on a highway. 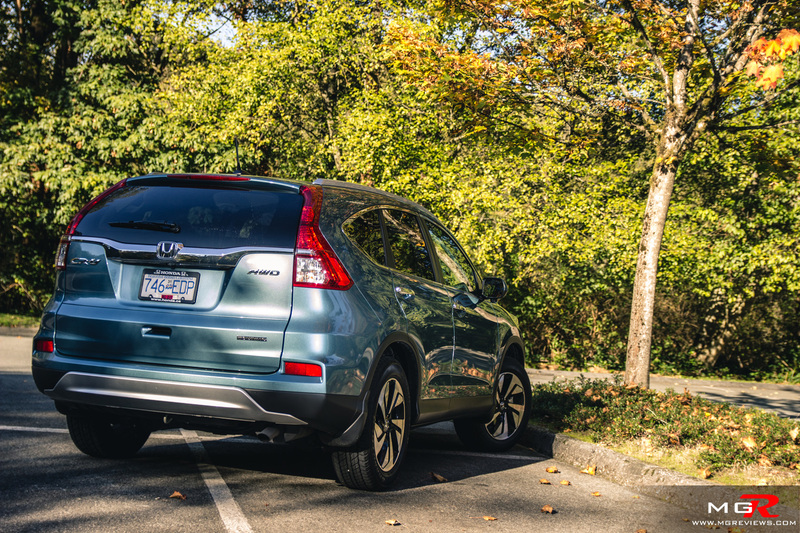 One downfall of the Honda CR-V is the fact that it is not offered with any other engine choice. The Ford Escape and Hyundai Santa Fe Sport are both offered with a turbocharged engine that bring the power up to the 250hp range and the price remains relatively similar to that of the top spec CR-V.
On the move, the Honda CR-V is one of the most comfortable small SUVs on the market today. The suspension soaks up road bumps and imperfections with ease. Road and wind noises are kept to a minimum making for calming work commutes. But setting off from a stop can be a bit noisy due to the fact that the engine’s power comes at higher rpms. From a stop or passing on a highway, the engine needs to rev past 3000 rpms. But on the plus side, shifting is very smooth in the CR-V…. almost too smooth. Actually it doesn’t shift at all because it has a CVT (Constant Variable Transmission) and the “shifts” that are felt are actually virtual gears that are programmed in the transmission to give the feeling of shifting. When CVTs first appeared on vehicles, they would hold a certain engine rpm and vary it depending on the situation. But most customers were not used to this so manufacturers decided to program CVTs to mimic the operation of a traditional automatic transmission. 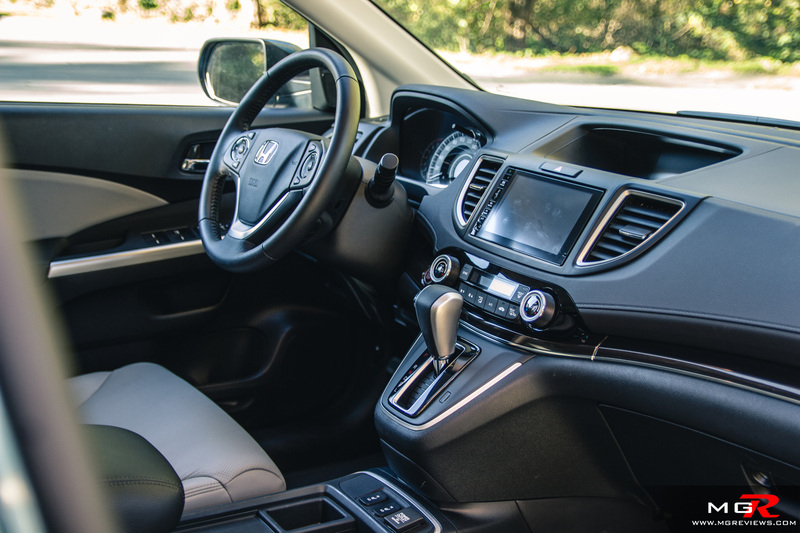 So although in this Honda CR-V it feels like it has a 6-speed automatic, the gear ratios can be varied depending on the driving conditions allowing for improved acceleration or fuel economy. 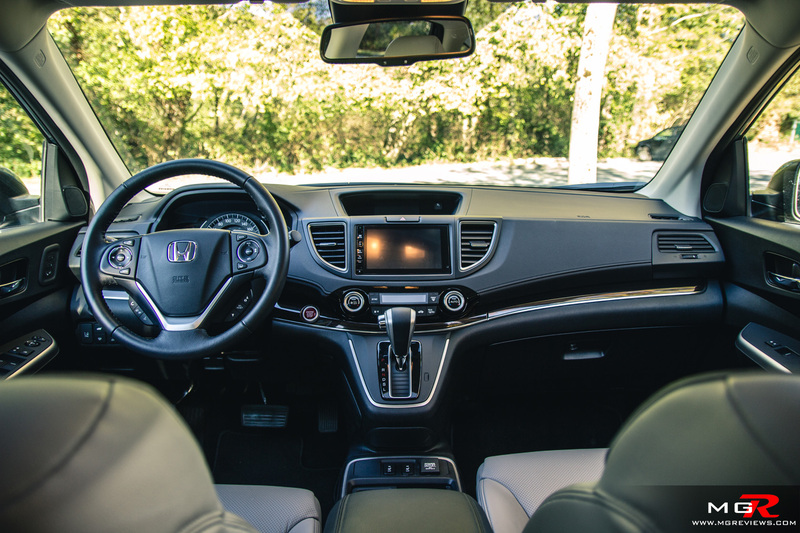 Comfort – The interior of the Honda CR-V is far more spacious than its exterior dimensions would suggest. In the front, adults can sit in any position they choose thanks to the almost infinitely adjustable front seats. 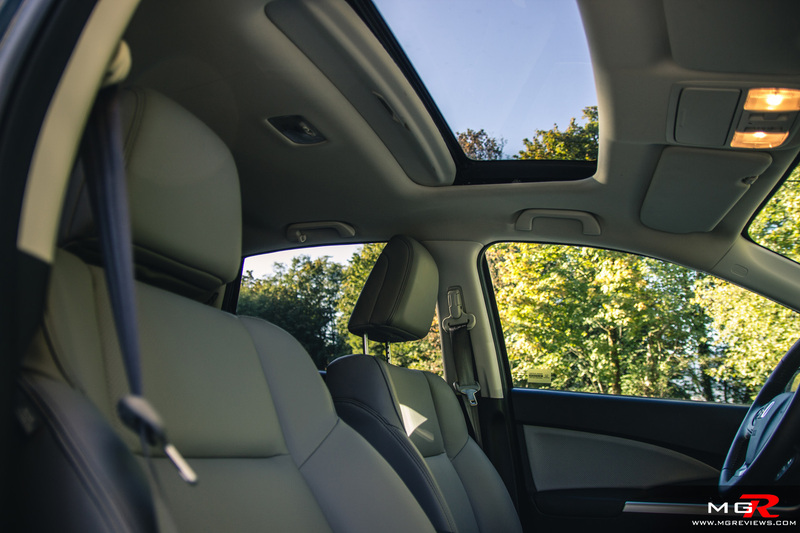 In the back, rear occupants can benefit from a completely flat floor for more leg room and also the reclining seats. With those rear seats folded flat, the interior cargo measures at just over 2000 L of space which is on par with all of the other small SUVs. Loading and unloading cargo is a breeze thanks to the low trunk floor but also the rear doors that open at an almost 90° angle. Unfortunately most of the interior is littered with hard plastics. On perhaps a lower trimmed CR-V this would not be a problem but on higher trims, it’s not what you’d expect when paying a higher price. 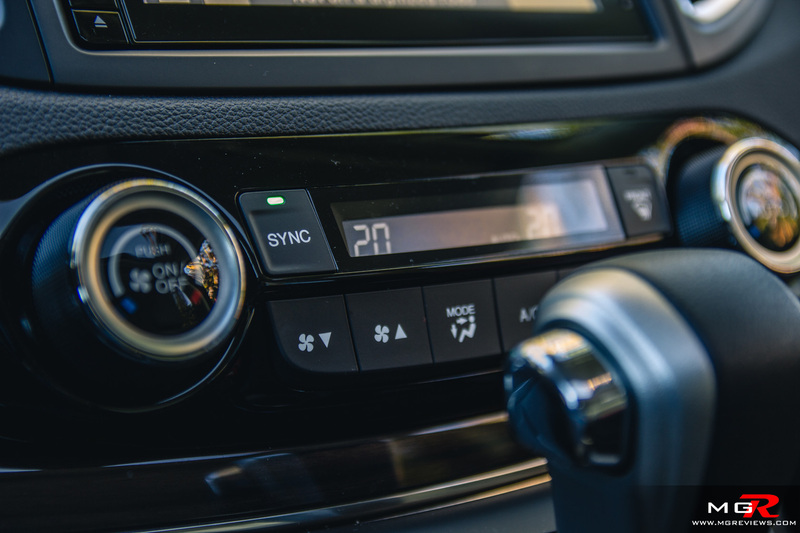 The infotainment system is relatively intuitive to use and it has options for just about every aspect of the vehicle but it really suffers from not having a volume and tuning knob. It may not sound like a big deal but it’s more intuitive for most people to turn a knob for volume or tuning rather than having to press buttons. Odds and Ends – When it comes to tech, the Honda CR-V is pretty much loaded with everything one might need and want. 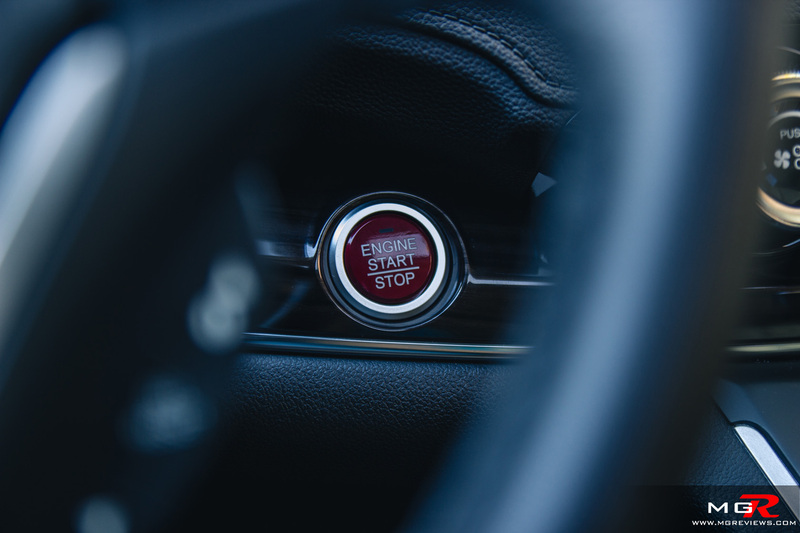 Navigation, backup camera, lane departure warning… these are becoming the norm across all manufacturers whether they be luxury or mainstream. 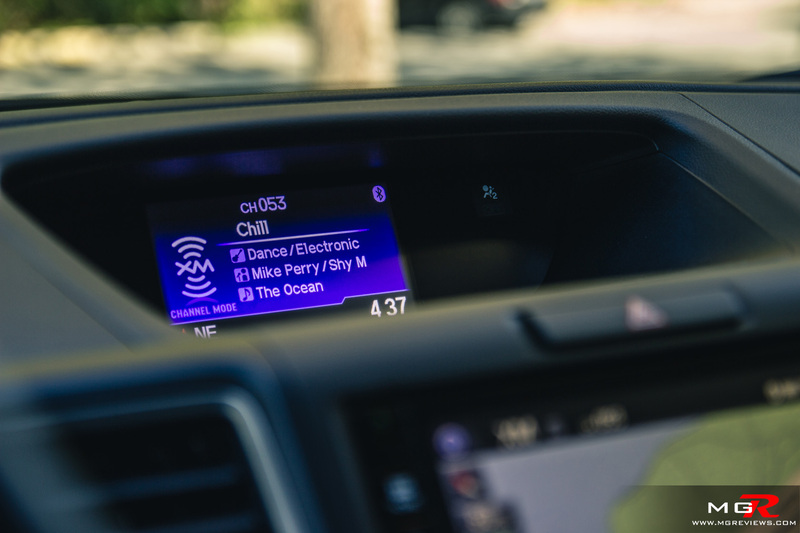 However the CR-V comes with 2 electronic gadgets that are not so common yet. Firstly is the right hand camera. It is a camera in the right side exterior mirror that activates with either a push of a button on the indicator stalk or automatically when you signal right. To me this seems just like a gimmick because drivers will likely rely more on the camera rather than performing a shoulder check when changing to a right lane or turning right at an intersection. Furthermore, it can be a bit difficult to judge the distance between the CR-V’s back bumper and the front of a vehicle in a right lane when changing lanes which can lead to accidents or inadvertently cutting off someone. Second bit of gadget that’s starting to gain popularity among auto manufacturers and that is fitted to this Honda CR-V, is lane keep assist. 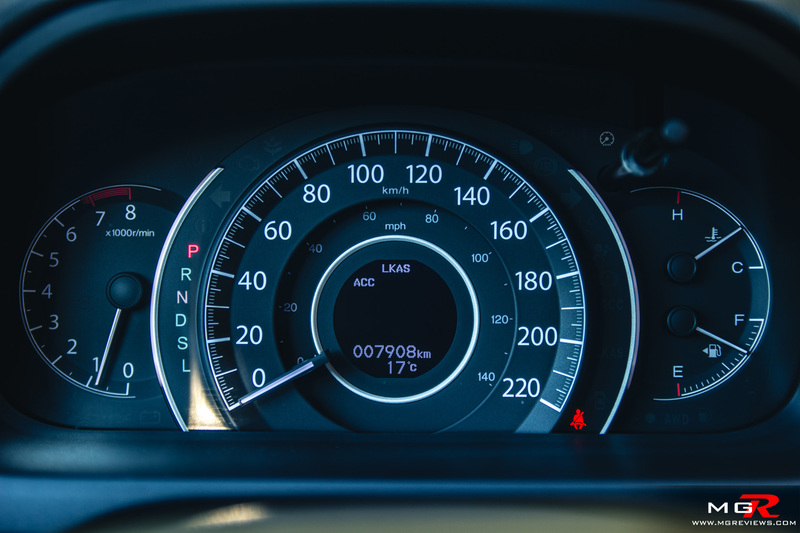 At highway speeds, the vehicle can sense where the road lines are and will automatically keep itself between the lines of the lane that you’re in. Working in conjunction with adaptive cruise control, the system is semi-autonomous but I would not recommend taking your hands off the steering wheel because around sharper corners it will not keep the vehicle in between the lines. Although the trend seems to be heading towards autonomous vehicles, the technology is not there yet. 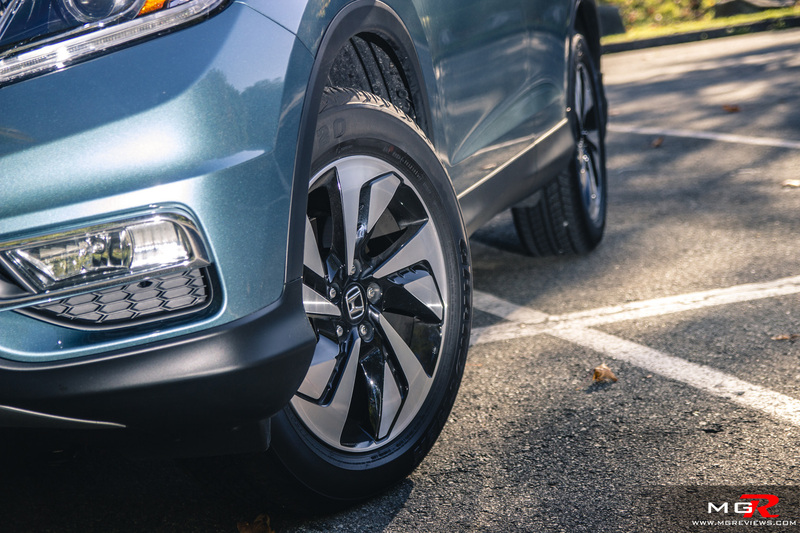 The lane keep assist and adaptive cruise control on this Honda CR-V are only there to prevent an accident when the driver is momentarily distracted from driving. Though everyone knows that distracted driving is very dangerous, it still happens on a daily basis and features like these can somewhat help in preventing a serious accident. 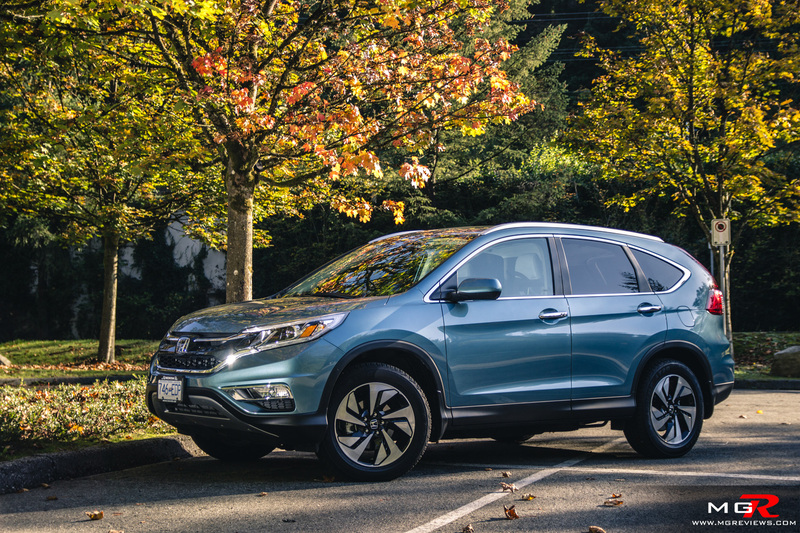 It is easy to see why the Honda CR-V continues to be among the best sellers in an overcrowded small SUV market. 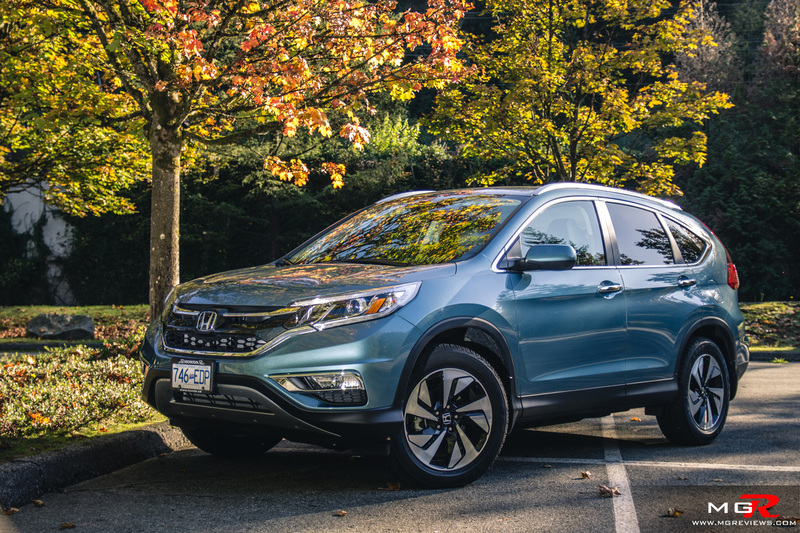 Excellent fuel economy, feature and technology packed interior, spacious & quiet cabin, and traditional Honda reliability still makes the CR-V one of the best small SUVs to own.